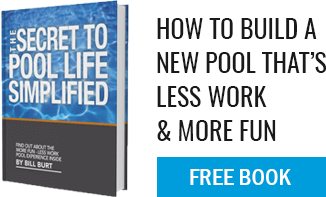 In the busy season of summer, your pool requires more chemicals than during fall and winter. This is due to fewer pollutants from people’s bodies from use but also due to evaporation, temperature, and sunlight. During the summer months, your pool water evaporates more quickly and algae/bacteria grows more rapidly hence the need for replacing chemicals more frequently. As the cooler weather rolls in, you can expect to have to check and balance your pool’s chemistry approximately once a week. Chlorine usage (and other sanitizers) as well as filter run-times will also decrease. The costs associated with owning a pool decrease in the fall and the water will be inherently clearer. So “deal” with those leaves and enjoy the beauty of the pool as the season progresses. As your water temperatures drop, you can start to lessen the amount of chlorine you normally add to your pool. Once your waters hit 51 degrees, you can stop adding chlorine altogether. This is because at 51 degrees and lower, algae and bacteria can no longer grow. The beautiful colors of the leaves are stunning once they change but as they begin to fall into your yard, they can wreck havoc on your pool’s filter system if left unattended. Be sure to pay attention and skim your pool to capture leaves and debris to avoid costly stains on your pool’s finish and to keep your system running well! Clean skimmer baskets as required (sometimes twice a day). Similar to requiring less chemicals, you can also limit the amount of time you run your pool pump and filter to four to eight hours a day to compensate for the reduced use of your pool. At Aqua Pool and Patio, we think that there is nothing better than a quick dip in a pool at the start of the brisk season to really rejuvenate your mind and body. Take advantage of the crisp autumn weather before it is time to close the pool down for winter. Plus, if your backyard has a fire pit, there’s nothing like warming yourself up around a nice fire with family and friends to celebrate the change of seasons after a swim!